I couldn’t believe how nice these are and lightweight. They look beautiful with my shabby -chic themed dinning room, on my farmhouse table! They are beautiful. 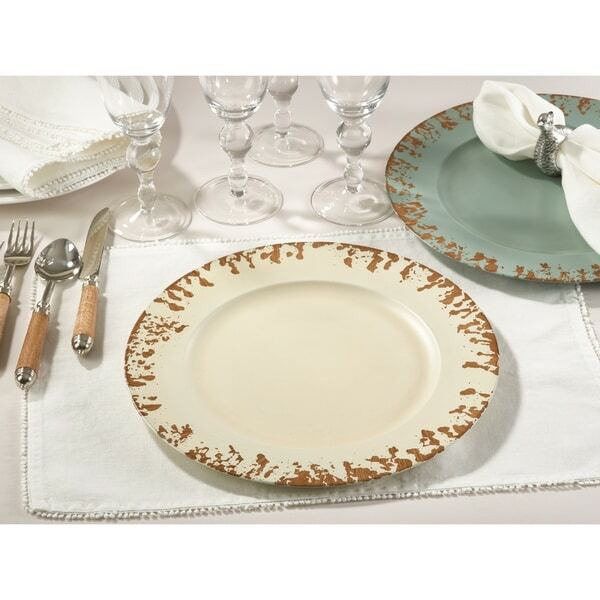 Add a pop of color beneath your dinnerware with these eye-catching charger plates. The distressed edge evokes a modern feel and coordinates beautifully with rustic elements for a farmhouse chic table setting. Dimensions 13.0 In. X 13.0 In. X 1.0 In. These are great. They are not as real looking as i was expecting but they do the job. If you have table all set then you cant tell at all. For the price you cant beat it. Shipping was fast and got here on time as expected. These are nice, however they arrived very dirty. I like the color they look exactly like the stock photo. Overall I’m happy because they go well with my distressed cabinets. These seemed used even though the box had not been opened. The Ivory is more of a light gold than Ivory.